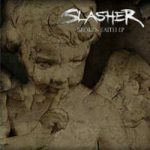 Discography – Slasher – Metal from Brasil! Katharsis is the second studio album released independently on February 13th, 2014. This project was produced at Antfarm Studio in Aarhus, Denmark by renowed Tue Madsen, who previously worked with THE HAUNTED, DARK TRANQUILITY, KATAKLYSM, among others. The artwork was signed by the french designer Stan W Decker. The album’s title refers to catarsis under a psychological optics. This is a term well used in other contexts, like religion and arts. In this work, the band makes an allusion to an emotional collapse which results in renewal and liberation, causing a change in the point of view. Overcome was recorded in 2013 at Mix Music in Amparo, Brasil. The production was at the hands of renowed Tue Madsen at Antfarm Studio in Aarhus, Denmark. This work was marks the recording debut of the new vocalist Paulo Martins (Skeeter). This single also became a music video, which can be seen here. 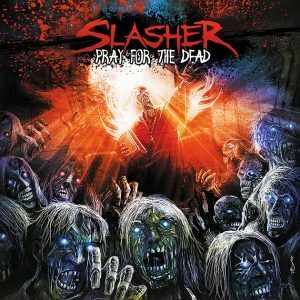 Pray For The Dead is the band’s debut album. Released on May 13th 2011, it was recorded and mixed at Piccoli Studio in Campinas/SP. Produced by Ricardo Piccoli & Slasher. The cover artwork was made by the french artist Stan W-D. This album synthesizes these early years of the band. 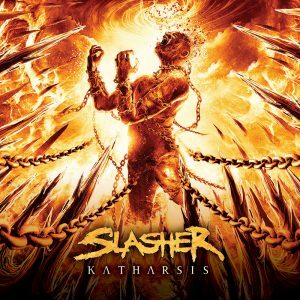 The tracks were composed between 2008/2010 and have a predominant Thrash Metal influence. The track “Hate” features Raphael Olmos, Kamala‘s singer and guitarrist. 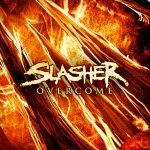 This participation and the stages of the album’s development were recorded on video which are available on YouTube at SlasherBR channel. The single Time To Rise was recorded at Mix Music Studio in Amparo/SP and the production was assigned by Ricardo Piccoli, who masterized the track at Piccoli Studio in Campinas/SP. It was self released on April of that year and, just like the first EP, it was very well received by the fans who have written excellent reviews in the Roadrunner Records social network website, making it achive the 35th place in the global ranking. 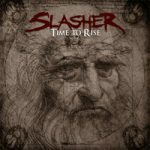 The single also guaranteed the 5th place among the best bands in the state of São Paulo, according to a poll conducted by Whiplash.net (one of the main brazilian websites). 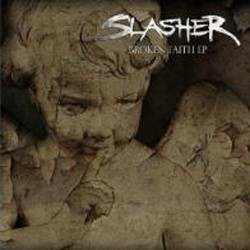 Broken Faith EP is the first official record of the band. Produced in December 2008 by Ricardo Piccoli at Piccoli Studio in Campinas (SP). Self released on January 1st, 2009. It was very well received by the media. It was featured in the section Garage Demos of the Rodie Crew magazine n.131 and obtained grade 8/10 in a review published at Whiplash.net. In 2010, the song Tormento ou Paz was selected by major names of brazilian’s music market (Bruno Baptista – Sony Music artistic manager, Raphael Miranda – SWU/Maquinaria producer, Luis Garcia – EMI Music strategic marketing manager, among others) to participate in the first compilation of the new brazilian social network, Melody Box. Slasher was the only rock/metal band in that compilation.